Nebraska’s Central Platte River always becomes a focus of attention about this time of year as migratory ducks and geese descend upon the river by the thousands and millions, followed shortly after by a half million sandhill cranes. This year, the river grabbed our attention a little early when ice jams shunted flowing water across several thousand acres of nearby land, including some of our prairie. I’ll provide some more descriptions and photos of that event next week, but for today, here are two images I took yesterday as I walked around an ice field sitting on top of that prairie. 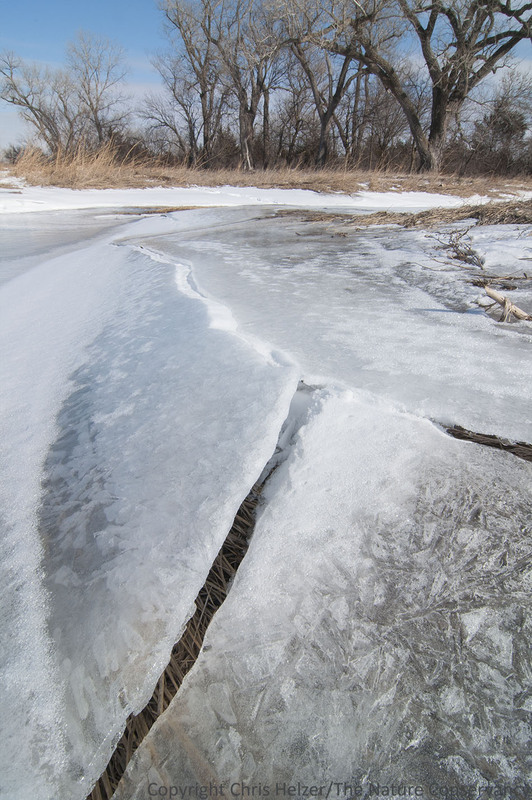 A crust of ice across the top of a prairie slough cracked apart as the water receded beneath it. The Nature Conservancy’s Platte River Prairies, Nebraska. A prairie slough, normally a groundwater-fed wetland, flowed with river water for a week or so during the flood. 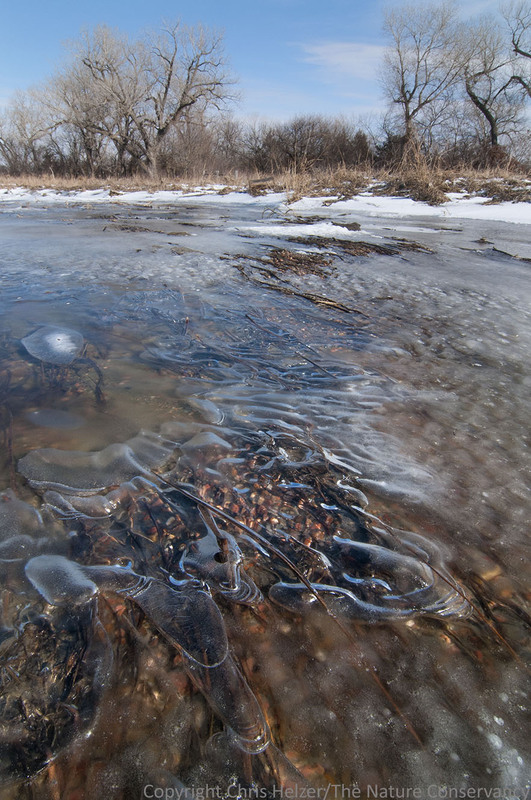 This entry was posted in Prairie Natural History, Prairie Photography and tagged flood, flooding, frozen, ice, ice jam, photography, prairie, water by Chris Helzer. Bookmark the permalink. Love your water pix — these are fantastic! Thank you for sharing the prairie through the seasons. The slough photo is particularly good. Like your use of “slough” – do you know Barry Lopez’ book Home Ground: Language for an American Landscape. To add to his definition, when I lived in the Inter-Lake region of southern Manitoba, anything wet that wasn’t a river or a like was called a slough. Hi Jean, I don’t know the book, but I like his definition!